I can’t believe I am back here in New York for my 50th high school reunion. Where did the time go? We aIl look at our families and friends’ families and say, I can’t believe you have grown so quickly or I can’t believe you have been married for 20 years. The next question we ask ourselves is how has the individual changed and in some cases what is different now. So, I am always asked how has the art market changed in all my years in the business? Though I often feel that I am doing what I have always done, there is no question that it has changed. I came into the art business in the mid 1960’s and now I believe that it was the end of an era. For the first half of the 20th century this country was hungry for the history and heritage of the old world. Many great collections were built at the beginning of the 20th century. Those of Henry Clay Frick and J.P. Morgan are probably mentioned the most. After World War II there were cash-rich Americans hungry for the art from the art-rich cash-poor Europeans. It was a perfect symbiotic relationship. By the end of the 1960’s that era was disappearing. Though it was never a business in the usual sense the art market began to change from small to big time. Art was no longer just sought after by collectors trying to build collections and social status but also buyers looking for profitable investment. The auction houses gave the greatest impetus to this new phenomenon. I remember that at the first Sotheby’s and Christies auctions that I went to the auction room often consisted of a large table with the auctioneer at one end of the table and 10 to 15 dealers sitting around him. The lot would be announced and then it was often passed around the table for closer inspection by the bidders. Today, the market has become much more open with private collectors sitting next to the dealers and some from both categories on the telephone calling in their bids either in order to conceal themselves from the curious, such as the press, or out of fear that if they were seen bidding, others would jump in. 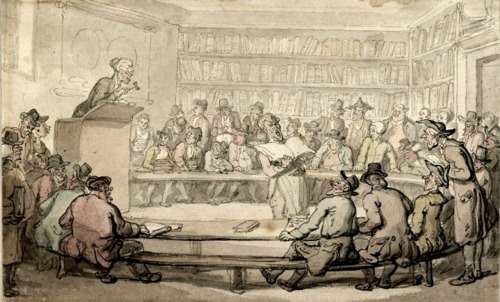 Thomas Rowlandson "A book auction at Sotheby's"
In the early 1970’s Peter Wilson of Sotheby’s began his monetization of the art world, which included new policies such as no longer extending long credit terms to dealers and his best known and much-reviled addition of the buyer’s premium. Of course, combined with the additional inflow of cash there were aggressive campaigns both in the press and on an individual basis to move the market towards the auction houses. Indexes were produced to show how much the art market increased each year, often ignoring the fact that there is no single art market but many. Slowly but surely the emphasis went from the dealers to the auction houses. Clients would no longer depend on “their” dealer to get advice but relied more on the “expert” in the auction house. Results depended on the knowledge of the individual in charge. It was now Christies or Sotheby’s says the piece is a good buy, not Bob Jones at the auction house. In the past families like the Rothschilds felt it undignified to give works of art to the auction houses or to buy there but in the new world they had no compunction about doing so. At every art dealers’ association meeting across the globe the same question came up. What are we going to do about the auction houses? They had very limited success in doing anything until the next incarnation of the art market, - the art fair came into its own with the higher end dealers participating. At art fairs collectors who were intimidated by going into a gallery could see a wide variety of works of art from a wide variety of dealers and be able to leave without having to open a door. It has been referred to as one-stop shopping. The dealers had finally found competition for the auction houses. Collectors also had to make up their minds quicker just like at auction in fear that the next collector through might snap up “their” discovery. Now in the 21st century a new competitor has been added to the mix - the internet. This one includes both dealers and auction houses. In some ways it may be called the great equalizer. Everyone including the private collector has the ability to send their message to an even wider public than the auction houses used to reach with their catalogs. To everyone’s surprise collectors are even willing to bid and buy without actually viewing a work of art first hand. All this has made the art world a little less intimate and the opportunities to have quiet and informative discussions with collectors and curators are often reduced to a quick conversation on the fly. Thank goodness the collector who is not just looking for an alternative investment does still exist and curators still come to our gallery and we can sit down for a friendly chat. **An apology: A couple of weeks ago I wrote a missive on the exhibition, “The Steins Collect”. There I substituted the Villa Savoye by Le Corbusier for the Villa Stein. That has now been rectified in the Missive.